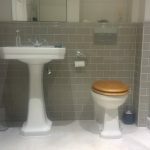 Richmond bathrooms is based in Richmond upon Thames. The area has a wonderful array of properties from beautiful town houses to cosy flats. 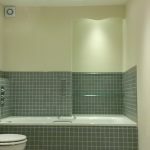 We are proud to say we have fitted bathrooms in them all. Taking design inspiration from the stunning river views and the vast green space provided by Richmond park we have installed bathrooms to meet the needs of the vast spectrum of Richmond residence. 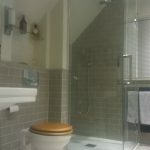 Below are pictures of some of our Richmond bathrooms installation projects. Click any of the images below to get a full size picture. These beautiful hand made chevron wall tiles are made by Smoke and Fire. 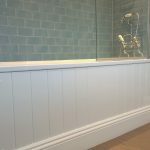 The look stunning as a feature wall behind the traditional Burlington fittings. Close coupled WC and cloakroom basin from Burlington. Chevron wall tiles from smoke and fire. 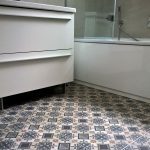 These patterned floor tiles create a nice effect in this traditional style bathroom. 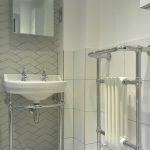 Hand made chevron wall tiles with a Burlington basin and towel heater. 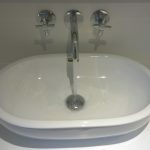 This Burlington bath filler tap and bathscreen look great with a plain steel bath and white tiling. 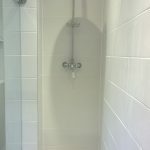 A wetroom can be the best option when space is tight. 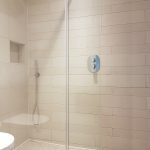 This walk in shower has a feature wall created using Marazzi (sistemN) tiles in different sizes and textures. Recessed shelves provide storage and the Saneux ceramics are combined with Cifial taps. 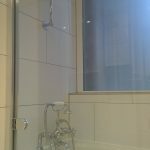 The shower screen with a moving flap is a Merlyn 8 series shower wall. 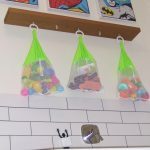 Recessed shelves in shower areas make really neat storage for shampoo bottles and soap. 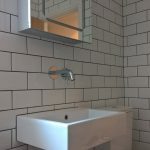 A saneux project wall hung wash basin and Cifial Techno mixer tap. 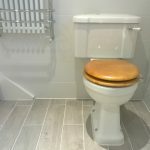 At Richmond bathrooms we are used to coming up with practical ideas to help with the needs of your family. The wetroom floor area uses the Schlüter-KERDI-LINE-H /-V wetroom floor former. This large family bathroom features a Hudson Reed quartet double vanity unit in Gloss grey. 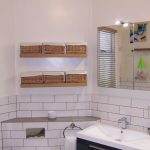 These solid oak floating shelves with wicker baskets on them make a good bathroom storage solution. 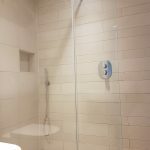 Concealed thermostatic shower mixer valves are the ideal way to control a hand held shower and a fixed head in the same shower area. Where to put the bath toys is always an issue in family bathrooms. These nets provide a great solution. 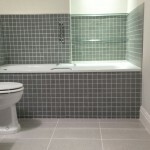 This free standing bath looks great with the white metro wall tiles. 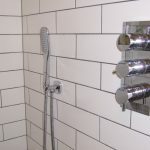 These large size metro wall tiles relly stand out with grey grouting. 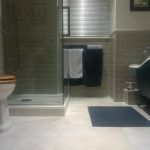 The large format light grey floor tiles ties in well. A bath overflow filler can be controlled by the same vavle used for the shower. 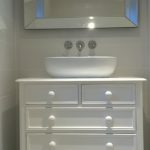 A large wall hung vanity unit with drawers and plenty of space around the basin. 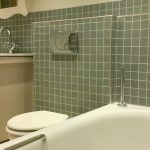 These patterened bathroom floor tiles look great with the plain white vanity unit and bath panel. This reclaimed chest of drawers makes an excellent basin unit. 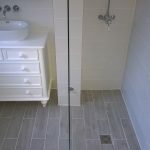 The floor is tiled with Tabula fog tiles – these are a wood effect tile made of porcelain. 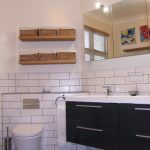 At Richmond bathrooms we are happy to adapt or work with reclaimed materials. 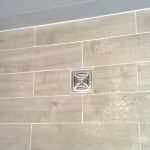 This wetroom shower area features a Burlington exposed shower valve and rigid riser. 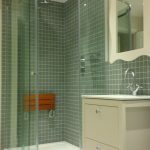 This wetroom shower area works well with the wood effect tiles and reclaimed set of drawers used as a vanity unit. 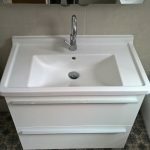 The countertop washbasin works really well with the relaimed unit. 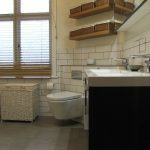 The Burlington close coupled WC is a elegant feature of this bathroom. 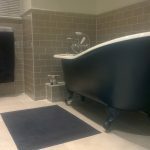 This wetroom uses the impey aqua dec to create the wet area of the floor. This vanity unit has been built out of a reclaimed chest of drawers. 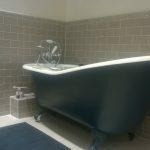 This traditional style bathroom features fittings from Burlington and a traditional cast iron bath from the Cast Iron Bath Company. 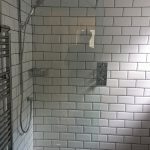 Sometimes a bespoke solution is the only way to install a shower cubicle in a loft space. 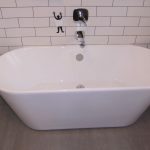 This roll top cast iron bath has been hand painted to match the bathroom. 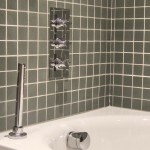 These green metro wall tiles from fired earth look great with the matching dado rail for detailing. The mirror cabinet and shelf are bespoke and recessed into the wall cavity. Roll top cast iron bath from the Cast Iron bath company. 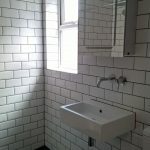 If you feel too much tiling closes a room in keep it to a minimum and only tile the shower area. 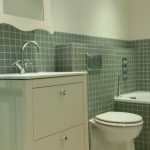 Good quality bathroom paint can provide a tough, cleanable surface around the rest of the room. 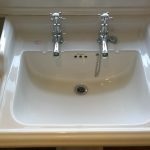 At Richmond bathrooms we can offer expertise in all types of bathroom finishes and surfaces. 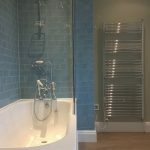 Light blue metro wall tiles and traditional steel bath. 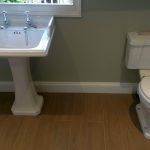 Engineered natural wooden flooring can look good with traditional bathroom fittings. 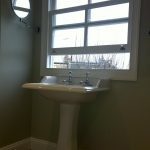 Sometimes you have to position the basin under the window. The pull out mirror is the ideal solution in these cases. 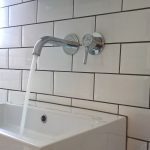 Traditional bath filler tap with a shower divertor on a steel bath. 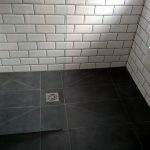 The metro wall tiles really stand out with the dark grey grout and slate grey floor tiles. 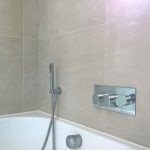 The modern concealed tap and shower valve also help to give this bathroom a modern feel. The recessed valves out two outlets controlling the fixed head shower and the handheld. 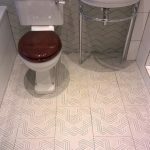 This wetroom floor is formed using an impey aqua dec.
At Richmond bathrooms we are very proud of our tiling work and this green mosaic certainly proved a challenge. 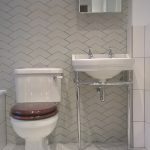 Continuing the pattern over different surfaces and areas can be difficult with a mosaic tiling but the result in this bathroom looks spectacular. Bathstore traditional style basin unit with drawers. This lit recess makes a nice feature in this bathroom. 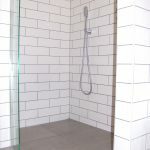 A pull out hand shower hides away the shower hose beneath the bath when you aren’t using it. This off set quadrant shower cubicle has a pull down wooden seat. 1800 bath with a tiled bath panel in green mosaic. 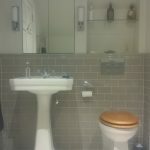 We are able to work with all materials at Richmond bathrooms and this installation provides a great example. 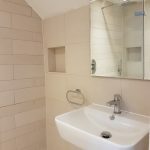 Limestone tiling and natural Oak provide a great finish to this modern bathroom.